Enjoy a haunted excursion that covers ghosts, vampires, New Orleans history, culture and architecture, as well as its cemeteries with a real EMF Meter (Ghost/Paranormal Detector). Stroll down the streets of the French Quarter while hearing detailed stories about New Orleans. This tour gives meaning to the saying 'laissez les bon temps rouler', the Cajun expression meaning "Let the good times roll." You will be allowed to stop in bars along the tour route to grab a drink to-go and then the tour group heads out to the next location. Please keep in mind that some bars allow children inside, however some do not. This Haunted Excursion will take you through the world famous French Quarter, also known by locals as the Vieux Carre, meaning "Old Square". 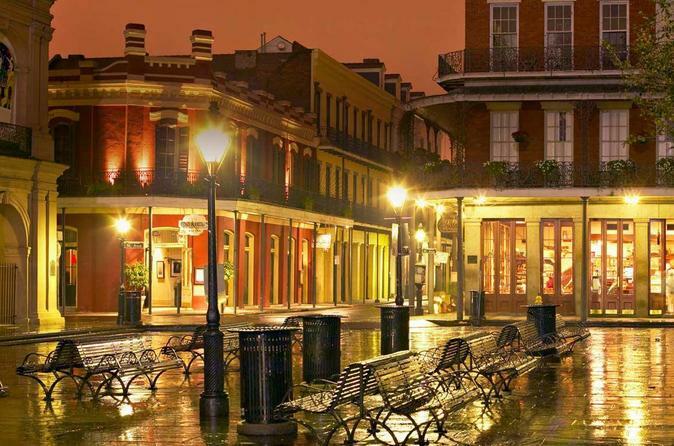 The French Quarter is one of the oldest neighborhoods in the U.S. and is made up of 78 blocks. It is also home to over 200 bars, world renowned jazz clubs, and amazing signature restaurants. Guests will be allowed to stop in bars along the tour route to grab a drink to-go and then the tour group heads out to the next location. Please keep in mind that some bars allow children inside, however some do not. Do you know what pirates, prostitutes and convicted felons all have in common with with the founding of New Orleans? Or why locals walk down to Jackson Square when it rains? Discover it all on this history packed tour of the French Quarter and hear about New Orleans' countless unsolved mysteries, and strong paranormal activity. That is probably why it is referred to as one of the most haunted cities in the United States. During this tour a real EMF Meter (Ghost/Paranormal Detector) will be used. You'll also be exploring the dark side of New Orleans history, visiting multiple locations of unsolved murders and suicides. Hear stories of real documented reports of vampires and ghosts roaming around the streets of the French Quarter while visiting locations known for vampires who held their victims and fed off of them. Get ready and by all means, do not forget your camera. This group tour will explore Louisiana's complex culture and you will experience the magical mystery that makes New Orleans so irresistible. You will notice the beautiful architecture throughout the French Quarter and be shown where Hollywood stars have decided to call the French Quarter home. Learn about New Orleans traditional burial practices and hear explanations as to why there are above ground cemeteries, why they recycle and re-use the same vaults over and over again. You will also visit locations where movies have been filmed and stop at one of the many attractions and national historic landmarks that this city has to offer along the way. Some tour locations are: The St Louis Cathedral, Cabildo, Presbytere, Ursuline Convent, Jackson Square, The Sultans Palace and The LaLaurie Mansion (known to be the most haunted house in New Orleans) just to name a few.